Free the Egg | Life, liberty, and the pursuit of chocolate. Please sign our petition! We need a significant amount of signatures to get the attention we need to Free the Egg. 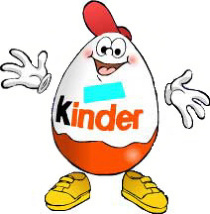 Kindereggs are considered contraband in the United States. Yes, the little, delicious chocolate egg with the cool toys in the middle are illegal. The insanity of it all! With this blog, we are dedicated to reversing this law and providing American children with the joy that millions of children in other countries experience through Kinderegg goodness.